The International Space Station is featured in this image photographed by an STS-130 crew member on space shuttle Endeavour after the station and shuttle began their post-undocking relative separation. NASA is forging ahead with a plan to send astronauts ontwo emergency spacewalks outside the International Space Station to fix a majormalfunction in the orbiting laboratory's cooling system. American astronauts Doug Wheelock and Tracy CaldwellDyson will replace a faulty ammonia pump on the space station's right, orstarboard, side during the repairspacewalks set for Saturday and Wednesday, Aug. 11.? Exactly what went wrong on the space station? How does the space station's cooling systemwork? The space station's Active Thermal Control System (ATCS)has internal and external components that are designed to maintain specifictemperatures aboard the station. The system uses mechanically pumped fluid inclosed-loop circuits that control heat collection, heat transportation and heatrejection. Energy from the station's solar arrays powers theelectronics and various other systems. The process creates excess heat thatmust be removed. Cold plates and heat exchangers, which are cooled by thecirculating water loop, help regulate the spacecraft's internal atmosphere.This liquid heat-exchange system removes the excess heat, and the energy isthen sent to radiators that eject the heat into space. Before this can happen,the waste heat must be exchanged a second time through the loop that containsliquid ammonia (rather than water, which would freeze if circulated in pipesoutside of the station). Ammonia freezes at minus 107 degrees Fahrenheit (minus 77degrees Celsius) at standard atmospheric pressure. The ISS has two externalcooling loops, which circulate the heated ammonia through huge radiatorsand release the excess heat as infrared radiation, simultaneouslycooling the station's equipment in the process. How bad is the problem for the space station? NASA space station program manager Mike Suffredini saidMonday that this malfunction is among the top potential failures for theInternational Space Station. NASA has a list of 14 different malfunctions (calledthe "Big 14") that are considered critical to the continued operationof the space station. This cooling system pump failure is on that list, but itis the first such failure ever to occur, Suffredini said. Did the failure endanger the space stationcrew? No. NASA has repeatedly stressed that at no point werethe six astronauts living aboard the space station in any danger or at risk ofhaving to evacuate the International Space Station. 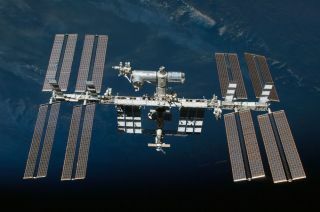 The space station is currentlyhome to three American astronauts and three cosmonauts from Russia's FederalSpace Agency. After the initial failure on July 31, the station crewshut down several systems and backup systems to reduce the heat load on onboardequipment. With those systems powered down, the station's second cooling loop ?Loop B ? is able to maintain cooling of the active equipment. The space station's Russian segment also has its owncooling system independent of the U.S. system. How can astronauts replace the station'sammonia pump? Spacewalking astronauts will replace the station'sstricken ammonia pump in two stages. During a Saturday, Aug. 7 spacewalk, theywill physically remove the big faulty pump module and then bolt down a spare pumpmodule in its place. One astronaut (Wheelock) will ride the space station'srobotic arm, while the other (Caldwell Dyson) will be floating free andtethered to the station's truss structure. Their main worksite is on thestation's Starboard? 1 (S1) truss segment, which is where the faulty pump islocated. The spare pump is on a storage platform about 30 feet (9 meters) away. During the second spacewalk, the astronauts are expectedto hook up the ammonia plumping and electrical lines to fully activate the newpump. There are five electrical connections and five liquid ammonia connectionsto be made. The astronauts must be careful when handling liquidammonia plumbing lines in order to avoid any residual liquid ammonia which cancontaminate their spacesuits and require extra decontamination procedures. Doesn't it take weeks to plan a spacewalk?How was this response so fast? Typically, for a repair like the upcoming ammonia pumpreplacement, NASA requires around two weeks to fully plan, rehearse and preparefor such a spacewalk. By chance, Wheelock and Caldwell Dyson were alreadyscheduled to perform a different spacewalk this week, so had already preparedtheir spacesuits and general tools for an outdoors procedure. Since the pumpreplacement is one of NASA's Big 14 space station repairs, the space agencyalso had a spacewalk repair plan in hand in case of an emergency. Together, those two facts have helped speed the spacewalkplanning along, though engineers at NASA's Johnson Space Center in Houston havealso been working round-the-clock to get things ready. How big are the station's ammonia pumps andhow much do they cost? The space station crew has said the size of the pumps issimilar to a laundry dryer. Each pump weighs 780 pounds (353 kg) and is 5 1/2 feetlong (69 inches) by 4 feet wide (50 inches). They are about 3 feet tall (36inches). NASA doesn't have an official cost for each of theammonia pumps on the space station. But a spare pump assembled on the ground in2009 cost about $3.9 million, NASA officials told SPACE.com. What space station systems were affected bythe pump's failure? Once the pump shut down, station astronauts turned offtwo of four control moment gyroscopes (used to maintain the station'sorientation in space without thrusters), some station power converters andcommand-routing equipment, as well as backup systems for the station's S-bandcommunications antenna and Global Positioning System. Some station systems wererunning without backups in place if they fail. The following day, Mission Control reactivated one of thetwo offline gyroscopes and astronauts installed jumper cables between somestation systems and the power system on the outpost's U.S. Destiny laboratoryto preserve redundancy. What happens if both U.S. cooling loops onthe space station fail? If both U.S. cooling loops fail (an unlikely eventaccording to NASA) the space station's U.S. systems could be powered down andthe crew moved into the Russian segment for a time, NASA officials have said.Since the Russian side of the space station has an independent cooling system,it could support a six-person crew for a short while, perhaps a few days untila repair or response is made, station managers said. How large is the International Space Station? The International Space Station is the largest structureever built in space by humans and has a backbone-like main truss as long as afootball field. On a clear night, the space station can easily be seen by theunaided eye as it flies overhead, at times even outshining the planet Venus. The space station is built in two major segments: A U.S.segment and a Russian segment. The Russian segment currently consists of theZarya and Zvezda modules, and several smaller docking and research nodes. TheU.S. segment includes NASA's Destiny lab, connecting nodes (Tranquility, Unityand Harmony) and international laboratories from Europe and Japan. Canada builtthe station's robotic arm and mobile railcar system. Altogether the station has 13 different habitablecompartments and features enough living space as 1.5 Boeing 747 jumbo jets(about equivalent to a three-bedroom house). Poll:Do We Need a New International Space Station?